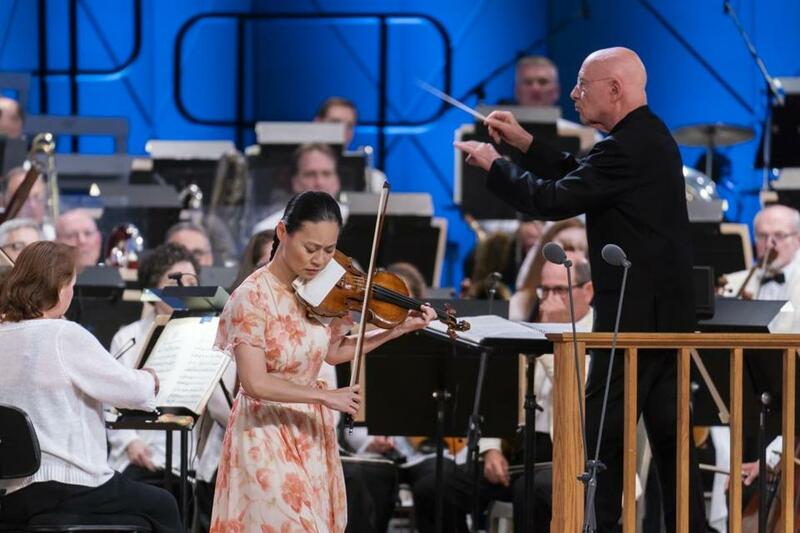 Christoph Eschenbach conducts the Boston Symphony Orchestra with Midori as soloist at Tanglewood Music Festival on Saturday. LENOX — In the world of classical music, centenary celebrations can cut both ways. They can provide a welcome opportunity to reconsider reputations, rediscover bodies of work, and reappraise former certainties. Yet at the same time, they also tend to accentuate less salutary myths of golden ages past, the notion that the present is but a pale imitation of musical life back then, when gods and heroes bestrode our stages and when composers wrote the only music that, so the thinking goes, still deserves to be played. Both sides of the centennial equation have held true in the case of Leonard Bernstein, whose 100th birthday has been toasted this year across the classical music world and most of all here at Tanglewood. The historic festival organized its entire summer schedule under the banner of “Celebrating Lenny.” And on Saturday, the day that Bernstein would have turned 100, it pulled out all the stops with a high-wattage gala concert in grand Lenny style. As a location for this particular centenary’s culminating event, Tanglewood was a natural choice. This was where it all began for Bernstein, where he led his first orchestra in 1940. It was the place where his deeply influential relationship with the conductor Serge Koussevitzky took root. In later decades, it was where he returned often, quite literally wrapping himself in Koussevitzky’s cloaks. It was also where his career ended, after his final concert here in 1990. Yet all of that said, it’s also worth remembering one episode less frequently recounted among the plentiful Bernstein anecdotes in local circulation: The BSO of midcentury chose to disregard Koussevitzky’s wish that Bernstein succeed him as the BSO’s own music director. The board instead went with the debonair European maestro Charles Munch. The snub could not hold back a figure like Bernstein for long. Still, it’s hard not to wonder how things would have turned out differently if the BSO’s trustees had taken a risk on the young Lenny back then. One early highlight of the night was the violinist Midori’s deeply felt account of the first movement from Bernstein’s “Serenade,” the work with which she made her BSO debut in 1986 under Bernstein’s baton (a performance during which she famously broke a string not only on her own violin but also that of the concertmaster). Nadine Sierra was the soprano soloist in a movement from the “Kaddish” Symphony led by Keith Lockhart, and Tilson-Thomas conducted a stylishly fluid account of selections from “West Side Story.” After intermission came brief selections by Mahler and Copland before Andris Nelsons returned to the stage to lead the massed instrumental forces, together with the Tanglewood Festival Chorus and vocal soloists, in a rousing account of the finale from Mahler’s Second Symphony. Punctuating the music were two brief films, rich with archival footage and reflections on Bernstein’s career from the likes of Gustavo Dudamel, Marin Alsop, Andrew Lloyd Webber, and Stephen Sondheim. But if Saturday night’s tribute had a second starring character, it was the Tanglewood festival itself. In so many stories, Bernstein’s musical coming-of-age seems to personify the idealistic era of Tanglewood’s own youth. As Williams stated in one film: “For the time that he was there, he was Tanglewood. And Tanglewood was Lenny.” As another speaker recalled, there were even meteorological affinities between the festival and its native star. Hence the term “Bernstein weather,” coined to describe the gloriously cloudless skies that his concerts seemed to attract with uncanny frequency. Bernstein’s political engagement, his insistence on the enduring linkages between art and society, was one aspect of the composer’s legacy raised only obliquely on Saturday. Yet this aspect was amplified in Sunday afternoon’s season-closing concert. The bulk of the program was devoted to the traditional account of Beethoven’s Ninth Symphony — given a vigorous performance under Eschenbach’s direction, with particularly affecting contributions by the Tanglewood Festival Chorus. This was the final outing for a large number of outgoing TFC singers — a fact that did not go unnoticed by the delighted Shed audiences or by members of the BSO, many of whom, in a striking gesture, turned their backs to the crowd and applauded the singers directly. Bernstein sets these lines with a glowing tenderness, and mezzo-soprano Sasha Cooke sang them on Sunday in a manner at once radiant and knowing. The song’s resonance, and its devastating critique, needed no elaboration. The music seemed to wash over the Shed and out onto the lawn, where thousands of listeners were seated on blankets and chairs, enjoying — one more time — the Bernstein weather.